You’re telling me *everything* is canon? 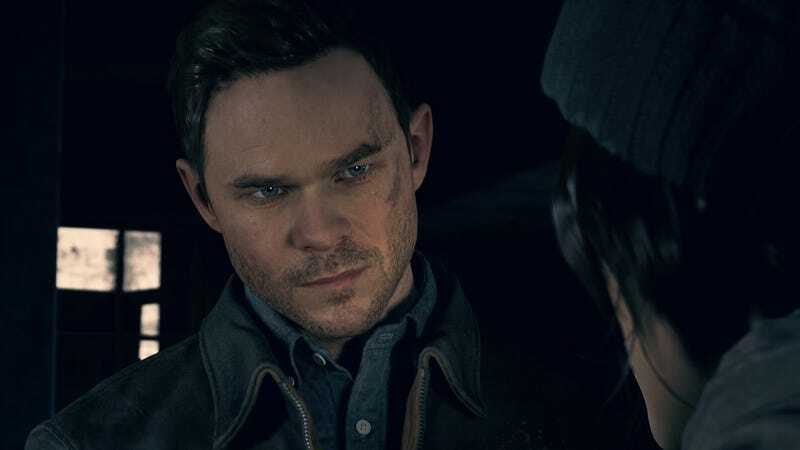 The novel Quantum Break: Zero State dropped the same day as the game, but only a handful of fans seemed to know about it. Those who did seemed skeptical—was this just the game they were playing in book form? Not quite. Novels based on video games have an interesting relationship with gamers: developers keep writing them, but even the most devoted fans often aren’t aware of them. Quantum Break: Zero State is a good example. Take this reddit thread, which asks if anyone actually read it. Most responders obviously haven’t. The book’s Amazon reviews are all positive, but there are only nine of them. Well, I did. I’m in the middle of the novel, and I promised myself I would stop if I couldn’t hack it. The thing is, I can hack it. I’ve decided to give the book a shot. I need to confess something. I’ve always struggled to see the point of a straightforward game novelization. If the experience is already there as intended, why transcribe it? Okay then. So what are we getting? This is not the Quantum Break you have played. Is this canon? Strictly speaking, no. But, in an experience where the player gets to make choices and shape the story, in a multiverse, what isn’t canon? Uh, lots of stuff, I’d think, including but not limited to most fan fiction. But maybe I’m cynical. Before you ask, I did play Quantum Break...on the PC. I know, I know, but we’re a Playstation/PC family. The issues on PC meant my impression of Quantum Break was a solid “muh,” but the acting and cinematography kept me going. Lake’s foreword tells us that Zero State is an alternate timeline novel. In another setting, that could be extremely annoying, but here it at least makes sense: Paul Serene (and the game) talks so much about choosing from different potential futures, it doesn’t seem crazy that we’re reading about a future no one chose. The biggest point in favor of reading the whole book is that Cam Rogers wrote it. The narration is smart, quippy, and quick—he doesn’t bog you down in scenery details you already know from playing the game. Even if you didn’t play it, he’ll give you enough that you can build the setting in your head, and he does it quickly. Another pro is getting to see inside Paul Serene’s head. Disclaimer: Paul was my favorite character, though whether this is because he’s played by Littlefinger is anyone’s guess. A behind-the-scenes peek at non-protagonist thoughts is always a win. Finally, the book is building up to things we know are going to happen from the game, and the foreword has warned us they won’t go down the same way: Paul insists that all he wants is to go to business school, and there’s mention of a gala. Now I have to know what happens at that gala when I’m not there to make Jack’s decisions. Now for the cons. The first is the dialogue. It’s clever and reflective, but it sometimes shows up in weird places. For example, this exchange happens while the two speakers are being held at gunpoint. It’s a nice chat between buddies, and I totally would have bought it if we were sitting on someone’s sofa rolling sweating cans of beer between our palms. But we’re not; we’re in a life-threatening situation. Maybe save the reflection for later? It’s also sometimes difficult to get a handle on Jack’s narration. The third-person narrator shifts perspectives, and the second chapter comes from Jack. Over the course of one page Jack says, “Will’s quirky personality metastasized,” (despite it being hard to imagine anyone using “metastasized” in their own head) followed by, “Nick had done Jack a solid and turned off the meter.” That sounds like two totally different people, and it gets jarring. You may agree with me or not on all of the above, and luckily, you can read the foreword and the first two chapters on Amazon’s preview. Once you have, I expect to see you in the comments with your yay or nay. I’m going to leave you with something positive. This is Nick talking about Monarch’s upcoming gala.